The seven identical towers of the Lindsay Park Mitchell-Lama co-op are arranged in the triangle between Broadway, Manhattan Avenue and Montrose Avenue in Williamsburg. There’s resistance at a Williamsburg co-op to hikes in service charges and other moves by co-op management and the city. But the development’s leaders and the Department of Housing Preservation and Development say the changes at Lindsay Park merely reflect an effort to protect a foothold of affordability in a rapidly gentrifying neighborhood. One resident even says the affordable housing development’s board and the city are using the co-op’s long waiting list to push her out of her home. “They just really don’t want me to live in my community,” says Sheila Washington, 64, who first moved to one of the seven towering structures next to the JMZ tracks with her parents in when she was 15. Zenith Properties, the management company contracted by the co-op’s board, filed with the city Department of Housing Preservation and Development (HPD) for her removal effective July 31 based on laws governing residency at the terraced, 22-story Mitchell-Lama buildings. Lindsay Park and other Mitchell-Lama developments face financial and administrative challenges. 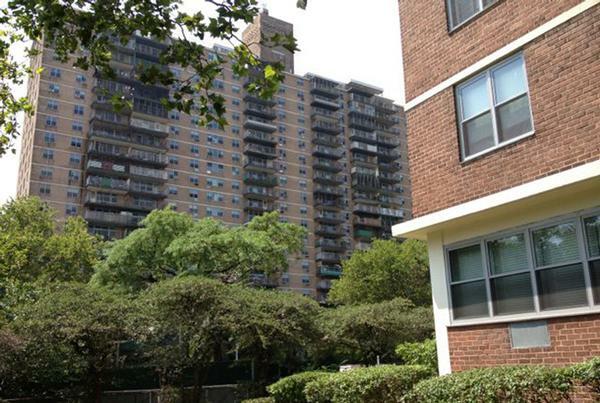 As rising rents across the city boost demand for the 2,702 affordable units there, officials at the Lindsay Park co-op board and HPD say they want to stabilize the development’s finances and rationalize its waiting list. Lindsay Park is a limited equity co-op, meaning that residents pay an upfront fee to become shareholders followed by monthly maintenance fees based on the size and location of the apartment. It stands out as the second-largest of the remaining 97 developments with over 44,600 units overseen by HPD but created through the state Mitchell-Lama middle class housing program. HPD’s role extends to matters such as managing the waiting list and overseeing the underlying finances of the development. Residents moving into vacant units must pay an initial fee of between $6,500 for a studio and $14,000 for a three-bedroom apartment, according to Jay Silverberg, principal of Zenith Properties. Monthly fees, or carrying charges, range from $700 for a studio to $1,150 for a three-bedroom. Restrictions mandated by Mitchell-Lama laws limit applicant and resident income, with a few exceptions, to levels based on the size of the household and the carrying charges. A family of four living in a three-bedroom may have an annual income of no more than $120,960, while a single person in a studio can make no more than $62,370. The sub-market rates make for affordable monthly charges for residents but precarious finances for the development. The 14-acre development with three swimming pools was collared with $42 million in debt upon its completion in 1965 after its original developer, Stanley J. Harte, did not pay off any of the property’s mortgage. Interest accumulated on the debt until its growth to $105 million led HPD to renegotiate the mortgage at a lower rate in 2003. But Silverberg, who started Zenith in 1999 after working for a prior management company on the property, says revenue will remain a pressing issue for Lindsay Park’s board. That doesn’t mean there are no frustrations with management. One resident who says he’s lived at Lindsay Park for 39 years expresses bewilderment with the development’s money woes. Anger over a carrying charge increase approved by HPD last year—an increase that will raise rates by 21 percent after 2014—inspired a resident petition protesting the added charges. The document, which has been signed by over 300 Lindsay Park residents, questions the accuracy of the development’s stated operating loss of $4.9 million in fiscal 2011 due to the inclusion of a $3.7 million expense for an oil spill cleanup in the calculations. The residents, who argue that such a non-recurring charge shouldn’t figure into the operating budget, are worried they won’t be able to afford the higher rates. “Shareholders are very concerned that they will lose their homes, not due to gentrification, but due to the increases in carrying charges, as well as to other concerns over the operations of Lindsay Park Housing Corporation,” reads their petition. Silverberg and Austin say the increases are necessary both for maintaining operations and paying off Lindsay Park’s debt. Silverberg notes that the residents on the petition are a small proportion of the development’s shareholders. “Ninety percent of the people did not sign that and really understand the need for the increase, which was explained at two town halls,” he says, adding that about 800 households are not subject to the higher rates because they receive Section 8 vouchers or are seniors participating in the city’s Senior Citizen Rent Increase Exemption program. Councilwoman Diana Reyna conducted two town hall meetings of her own with Lindsay Park residents last month in response to their concerns. Representatives from her office are helping Lindsay Park occupants apply for rent increase exemptions, and she indicated she would push for the development to apply for preventive health programming with the city Department for the Aging as a “naturally occurring retirement community.” Reyna says the monthly bills are a challenge for Lindsay Park’s growing elderly population. “It’s becoming an issue for families who have continued to live there over the course of 30 to 40 years because their family structure is no longer what would be an income from a husband, wife and children,” says Reyna. Washington maintains that an HPD administrative court erred when it found that she does not have the right to succeed the prior occupant of her apartment, James Middlebrook. After a series of traumatic clashes while living in another apartment in Lindsay Park with her mother, Washington moved in with Middlebrook in 2008 and lived with him for more than a year before he left Brooklyn. The HPD court ruled in a June 3 decision that she and Middlebrook did not have “an emotional commitment and interdependence.” But Washington says she’s being pushed out of the way for new Williamsburg transplants. Officials say it’s precisely because of the gentrification pressure in Williamsburg that they must maintain strict adherence to the waiting list. Julie Walpert, the assistant commissioner of housing supervision at HPD, says the agency is preserving units for occupants with a lawful right to live there by cracking down on illegal sub-letters and people who quietly sell off their apartments for vast sums outside the system. Past audits of the Mitchell-Lama program at both the city and state level have cited deficiencies in the turnover process. A 2008 investigation by the city comptroller’s office found that HPD’s lack of proper documentation could lead to “improprieties and irregularities.” A study by the state inspector general the year before concluded that there were “numerous instances” of waiting-list abuses at three Mitchell-Lama developments. Officials at HPD and Lindsay Park say they have strengthened their practices in light of the reports. Waters says he doesn’t know whether stories about rampant illegal subletting and sales by residents have basis in fact. But such claims take on political overtones in co-op boards like the 21-member entity that oversees Lindsay Park. The latter criticism came into sharp focus after the 2003 murder of an Asian-American couple living in one of Lindsay Park’s buildings. The wife in the pair, Josephine Lin, was a Lindsay Park screening-committee member who was reputed to be extracting bribes for preferential treatment. Rumors about a bias favoring Asian applicants led HPD to conduct an audit and mandate changes to the application process two years earlier. Austin, who had taken over the board presidency in 2002, successfully pushed for the waiting list to be completely administered by the agency. But not all residents think Austin and Silverberg have been fair. In a Sept. 30, 2011 letter to shareholders, Austin wrote that she wanted “to avoid the significant extra expense associated with an election.” Residents complain that the “proxy” voting system—which awards their vote in the annual board elections to Austin’s slate unless they choose to change it—is confusing and undemocratic. But Austin says voting machines in each of the seven buildings on election day allow for anyone to vote against her. While Reyna did not criticize Lindsay Park’s leadership, she says she wants to make sure that residents do understand their rights in matters like elections and waiting lists, something she says would counter “fear mongering” and help the development overall. “Everyone who lives in Lindsay Park should have the opportunity to participate in the process of making Lindsay Park better without fear and without misinformation,” she says. Even with all the politics, units in the development remain in high demand. Lindsay Park’s waiting list filled quickly in a 2004 lottery. Walpert of HPD says there are more than 3,000 names on the list for a studio apartment and 4,000 names for a one-bedroom. The list won’t be open to new applicants for another five or six years. “People who are getting in today waited about nine years,” adds Walpert. Lindsay Park’s monthly rates might make it worth the wait. The search for revenues to reduce the development’s debt has not pushed maintenance fees up to market rates. He and Austin both cited a $12.9 million state weatherization grant obtained with help from then-Assemblyman Vito Lopez and Reyna as a point of pride. Other revenue raisers include a tax assessment that allows Lindsay Park to get more money for each unit from new occupants, and energy savings from converting boilers to natural gas. Austin says the lower interest rate from the 2003 refinancing allows for greater flexibility on operational costs while mandating that Lindsay Park remain in the Mitchell-Lama program for another 40 years. The development’s enduring place in the city’s affordable housing stock does not mean there will always be a place for at least one of its residents. Washington has appealed her eviction with the state Supreme Court with help from Reyna’s office and will remain in her home past her prior eviction date as she awaits a ruling. She says she doesn’t have a backup plan for where she’ll live if she does have to move out but she feels a sense of gratitude toward other residents of Lindsay Park. Cora Austin daughter is a felon and does not work but yet she has an apartment in lindsay park…and has been caught stealing money and running scams in lindsay since forever and Cora knows and so does Silverberg Gay behind..They are all thieves and everybody in lindsay park knows it!! Tomeka Austin Google it! !